. White Stripes lead singer Jack White went to court on Tuesday and entered a plea of guilty to assault and battery charges that stem from a fight White had with Von Bondies lead singer Jason Stollsteimer. White entered the plea as part of a plea bargain. Instead of the possible year in jail, as part of the deal White was sentenced to pay a $500 fine, pay court costs and to attend an anger management course. He was also ordered to stay away from Stollsteimer. White and Stollsteimer were both attending a concert at the Majestic Theater Center in Detroit on December 13th, when shortly before midnight they got into a fight. Stollsteimer told police that White attacked him, punching him seven times in the face. White gave a statement saying he was acting in self defense. 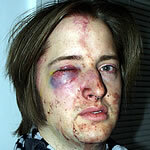 Jason Stollsteimer After the fight.